Ever wondered what being in the Lion King would feel like? Then you need to visit the Serengeti National Park in Tanzania, Africa! We visited this famous grass sea in December 2018 as part of our honeymoon and we used the well respected travel company Intrepid Travel (Road to Zanzibar) 2 week tour of Tanzania. This was our first time using an organised tour, and it was a great experience. The guide Clara was awesome and we met some great people from all over the world. As part of the tour we spent 2 nights and 3 days visiting the Serengeti National Park which included game drives and camping in the middle of this African wilderness. It was a highlight of the whole tip and is an experience I would highly recommend to anyone who loves animals and nature. It is not easy getting to the Serengeti if you are on a budget like we were. There are flights into the park from Ashua, Tanzania but as we were on an overland tour, we were transported to the park and around the park in Safari Jeeps…. Jeeps that were older than we were (30+ years). Imagine being a passenger for 6+ hours on a dusty gravel road in a 30+ year old jeep that has been around the block a few times… not comfortable. There were defiantly a few bruised knees and bumped heads along the way but luckily the beauty of the Serengeti made for a perfect distraction and the destination was well worth the journey. Due to the difficulty of the overland travel a higher level of health and fitness would be recommended. Our starting and end base was the small lake side town of Mto Wa Mbu. A cute little village with lots of mosquitoes. There is limited access to supplies here so it is best to stock up in Ashua. From Mto Wa Mbu we headed via our small jeeps to the Ngorongoro Crater. We started our adventure to the Serengeti on Christmas day and it was the most amazing Christmas day since before we found out Santa was a lie. The road to the Crater was very slow and windy and took us to a higher altitude than Mto Wa Mbu. It was slow going but when we reached the edge of the Crater our minds were blown by its size and beauty. The Ngotongoro Crater is like natures zoo, it is well protected by the craters edge and almost contains all the animals you would possibility want to see in Africa. We saw lions, elephants, rhinos, zebras, wildebeest, hippos, ostrich, baboons and so much more. The difference between the crater and the larger plains of the Serengeti is the number of tourists congregated in one area it was rush hour and you are always insight of other tour jeeps. On the great plains of the Serengeti you can drive for hours and see no one. Driving around the crater made for a wonderful morning but it was really just a taster of things to come. At the top of the Crater! Merry Christmas! After lunch we left the Crater and started the long dusty drive to our campground in the middle of the Serengeti. This is where we experience 2 of our 3 punctures, luckily our driver Mr Serengeti and our guide Clara made easy work of the repairs and we managed to get there with no more problems. The road to the campground we went through Maasai tribal lands and saw many traditional villages. It was a real reality check to see how the Maasai lived, many still in mud huts out in the wilderness. Once we were out of the foothills of the Crater the Serengeti flattens out, this is where we all of a sudden we started driving through millions of Zebras and Wildebeest and other grass eating animals. This was the great migration, one of the most amazing sites on earth! We saw literal Zebra crossings as they quickly got off the road to more fresh grass, and we saw the Wildebeest running and jumping around scared of our jeep. We soon arrived at the gates of the Serengeti, took some photos and appreciated the great wide landscape. As we got closer to the camp, Mr Serengeti received a radio notification… There was something exciting for us to see. We picked up the pace, took a sharp turn and some perilous roads then came to a sudden halt. It took us a while to realize what we were seeing but once we saw the Cheetah we couldn’t take our eyes off it. He was just like a big kitten prancing around and enjoying himself it was wonderful to see. The Serengeti chickens were also watching him carefully from a distance trying not to get too close. Once the Cheetah was out of site, the sun was setting and we had to get to camp. Our campground was in one of the forest areas in the park. As we turned a corner right before our last stop, we couldn’t believe our eyes, a family of elephants right on the road. What an amazing way to end Christmas day. Once at camp we sat around the fire, drank some red wine and chatted to the group about the amazing animals we saw today. Camping in the Serengeti is not glamorous like in the magazines. I am sure there are luxury camps around but that was not in our budget. Our tents were for 2 people and were all set up tightly together. There are no fences between us and the wilderness of the Serengeti. The toilet block is a good 3min walk away and whatever you do, you cannot leave the safety of the camping area and wander off by yourself. This made for interesting toilet experiences during the night. First you have to check for eyes using your head torch… if you see no dangerous eyes then you pop right next to the tent and pee there. There is no other option… I was not going to take my chances walking in the dark to the toilet block. A few weeks early at the camp a pride of lions made a buffalo kill right next to the camp so best not to wander off encase you were next. Anyway the toilet block was disgusting as by nightfall the campground had run out of water so the long drop hole in the ground toilets were not pleasant… especially as not everyone had a healthy stomach… The realities of travel. There were also cold showers available but as water had run out they were useless. It was also quite cool at night so best to bring warm clothes. Our tour included game drives around the Serengeti. The next day we had 2 scheduled, one first thing in the more then another in the afternoon. During the morning drive, we drove around the landscape looking for animal encounters. Our first encounter we stumbled across a Pride Rock wannabe site, this is where we saw a small family of lions soaking up the sun. At the same location a male lion was laying out in the long grass, he was majestic. Then out of nowhere a female lion pops up and they start mating. It didn’t last long but it happened again quite quickly and apparently they will be doing this routine for up to 2 weeks before the female goes out hunting for her mate. Our Intrepid Guide Clara, warned us, whatever you do, don’t go into the long grass. We can completely understand the reason for this. Lions pop out of nowhere are were impossible to see even when they were only 20 meters away. We did have to have a toilet break on a remote road near some long grass, everyone was very quick as there was a lion in the distance. Our morning drive took us vast distances across the park. We weren’t sure how our driver knew where he was going as it all looked the same, but he was very experienced and had worked in the park for many years. Our driver was very interested and told us lots of stories about his time in the Serengeti. He also tried to teach us Swahili. Turns out many characters in the lion king are just the Swahili word for the animal – Lion = Simba. It was a very hot morning so the animals were not so active. We stumbled upon a few more Cheetahs but they were all very sleepy. We also saw lots of grass eating mammals out in the grass, zebras stop being exciting after a while. Our evening game drive had a lot more action. We all really wanted to see Giraffes and we were treated to many close encounters, some even walked right up close to our Jeep. We also saw more families of elephants up close, visited a Hippo river which was so stinky (you smell hippos before you see hippos), we saw large buffalo heard and even a Serval cat which is quite rare. Our driver was very good at spotting animals from vast distances and he even spotted a dung beetle on the side of the road with a bit of poop. The only animal we couldn’t find during our visit to the Serengeti was a Leopard. We tried on all our drives and went to spots that had good chances of seeing one but we had no luck. We also, didn’t get to see a hunt or kill, maybe for the best but it would have been interesting to see. Game drives were an amazing experience and they were quite addictive. Ideally, another day or so in the park would have been ideal but it was time to move on and continue our tour. We had a long road to Zanzibar. A lot… The Road to Zanzibar 2 week tour starts at NZD $2,360 per person but as we went over Christmas it was a bit more. We can highly recommend a trip to the Serengeti National Park, a safari should be on your bucket list as it was one of the most incredible travel experiences we have both had. 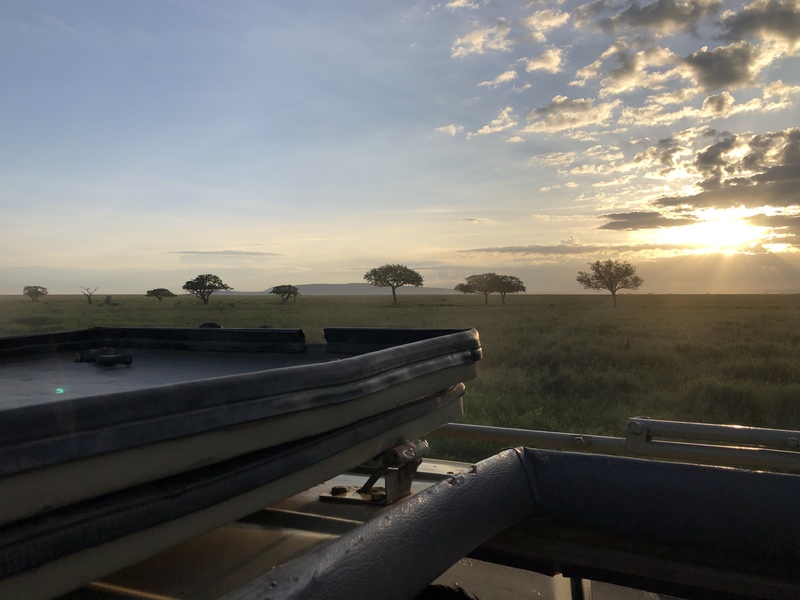 Safaris are not a cheap or easy thing to do but as we were sitting in the jeep at sunset looking out over the Serengeti, admiring the beautiful landscape and animals it made every dollar worth it and we would go back again in a heartbeat. Can you spot the Hyena in the grass?